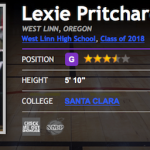 Class of 2018 guard Lexie Pritchard of West Linn, Ore., is emerging as one of the premier backcourt options in the class up and down the West Coast. 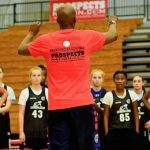 Chris Hansen’s takeaway (Seattle, WA – August 2016): Following a terrific second half of July, Pritchard used that momentum in a great way in this camp/showcase environment. 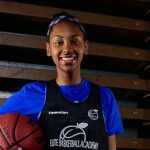 She’s become a more consistent shooter and it’s clear she’s put hours of work in the gym building her ball skill and ability to create. She’s forcing less and scoring more. 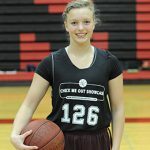 Chris Hansen’s takeaway (Oakland, CA – September 2015): Pritchard is a camp and showcase standout because she captures your attention in the drill work. She’s clearly a player that logs hours in the gym working on her skill set. Pritchard handles the basketball well with either hand and has a sweet jumper. She showed well in the 5-on-5 live play with some crafty passes and of course the crisp jumper. Add that to the fact that Pritchard plays with a lot of confidence on the floor and you have a dynamic option in the backcourt. Before signing w/Santa Clara, ‘18 Lexie Pritchard (OR) of @Fastbasketball earned @ChrisHansenPSB’s words @ELITEisEARNED Showcase. ‘18 G Lexie Pritchard (@LexiePritch3) of @Fastbasketball & @coachgriff3 signed with Santa Clara. She gives them a dynamic option on the perimeter. Shined @ELITEisEARNED. '18 G Lexie Pritchard (OR) to Santa Clara. Available '18 G Lexie Pritchard led FAST EYBL over NJ Sparks. '18 G Lexie Pritchard has a Portland offer w/major interest from Rice & Clemson. ’18 Lexie Pritchard (OR) was a MAJOR Stock Riser @CHansenBBall‘s event. Has a Santa Clara offer. 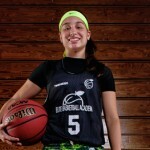 ’18 Lexie Pritchard is a SG to watch for. Crisp passing & all out scorer. You can find @LexiePritch3 & @fastbasketball at #PSBElite32 July 27-29.